Cannes is a small city located in the Alpes-Maritimes department of southern France. The city is famed for its world-renowned cinema festival that takes place every year in May. Cannes is part of the stunning French Riviera coastline that offers holidaymakers beautiful, azul-coloured waters and a warm climate. Cannes is known for its association with the rich and famous as it is littered with luxury hotels and restaurant. However, Cannes wasn’t always like this as its origins as a humble Greek fishing village (known as Aegitna) will attest to. 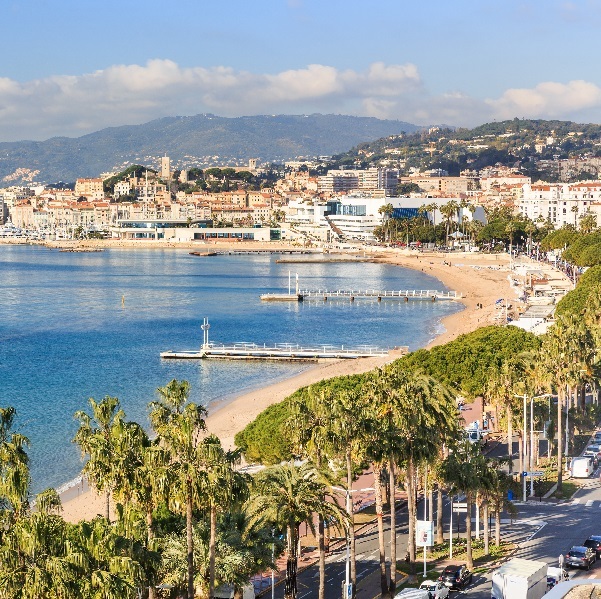 Only at the start of the 20th century did Cannes become the city that we are familiar with today after it underwent a period of Americanisation with tourists flocking over from the States and the establishment of a casino in 1946. Did you know that Cannes has more luxury goods shops than anywhere else in France outside Paris. Despite its small size, over 70 top name brands have shops squeezed into the 800 meters of its seafront croisette! La Croisette de Cannes: Take a stroll along the splendid bay of Cannes, known as La Croisette. Not only is the beach lovely with crystal clear waters and golden sand, there are a whole host of bars, restaurants and shops stacked along the promenade. Le Palais des Festivals:This bright, white architectural delight is the home to the annual film festival in Cannes and the perfect backdrop for your Instagram photo! The once-neglected building has its own Hollywood Boulevard in front of it, known as the ‘Chemin des Etoiles’ where celebrities leave their handprints in stainless-steel casts. Wander the Streets: Before becoming the luxury town it is today, the fishermen of Cannes were forced to live tough lives in the labyrinth of sinuous streets and steep stairways. Now colonised by bars and restaurants, the alleyways of Cannes still retain a certain charm and beauty to them. Lérins Abbey:If you’re looking to escape the city-centre, head out to the 11th century Lérins abbey on the island of Saint-Honorat. Just a mile offshore, this abbey nows lies mostly in ruins at the top of Suquet Hill alongside a museum that offers a wide collection of artefacts, ranging from archaeo-material to musical instrument. Nearby Towns: Being part of the French Riviera, Cannes is situated next to some stunning seaside towns and cities, including Antibes, Nice and Monaco. Take a drive along the beautiful Grande Corniches, soaking up the views and sun and exploring the best of southern France.